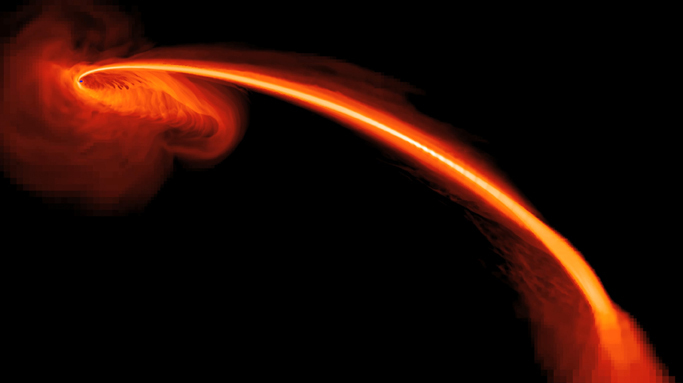 A star that wandered too close to a supermassive black hole was ripped apart. This discovery was made using NASA's GALEX telescope and the Pan-STARRS1 observatory in Hawaii. Researchers used Chandra data to rule out a competing theory of an active galactic nucleus. The galaxy where this violent act occurred is called PS1-10jh and is located about 2.7 billion light years from Earth. This computer-simulated image shows gas from a star that is ripped apart by tidal forces as it falls into a black hole. Some of the gas also is being ejected at high speeds into space. Using observations from telescopes in space and on the ground, astronomers have gathered the most direct evidence yet for this violent process: a supermassive black hole shredding a star that wandered too close. NASA's orbiting Galaxy Evolution Explorer (GALEX) and the Pan-STARRS1 telescope on the summit of Haleakala in Hawaii were used to help to identify the stellar remains. A flare in ultraviolet and optical light revealed gas falling into the black hole as well as helium-rich gas that was expelled from the system. When the star is torn apart, some of the material falls into the black hole, while the rest is ejected at high speeds. The flare and its properties provide a signature of this scenario and give unprecedented details about the stellar victim. To completely rule out the possibility of an active nucleus flaring up in the galaxy instead of a star being torn apart, the team used NASA's Chandra X-ray Observatory to study the hot gas. Chandra showed that the characteristics of the gas didn't match those from an active galactic nucleus. The galaxy where the supermassive black hole ripped apart the passing star in known as PS1-10jh and is located about 2.7 billion light years from Earth. Astronomers estimate the black hole in PS1-10jh has a mass of several million suns, which is comparable to the supermassive black hole in our own Milky Way galaxy. Coordinates (J2000) RA 16h 09m 28.30s | Dec +53° 40´ 24.20"
Yes, it did happen 2.7 billion years ago. In terms of distances in the universe, light years measure it. They also give you a time stamp. If something is 2 million light years away, it took the light 2 million years to get here. So, as stated previously, yes. Incredible!!!!!!!! Thanks for letting us see the wonderfull and amazing parts of the universe where we us live. A light year is not measured in time, but in distance even though it is named light "year". Wonderful. I have a question, if the distance is 2.7 billion light years does this mean this event happened 2.7 billion light years before? Iam looking at the computer simulation of a supermassive blackhole 'ripping' apart a star that traveled too close to the event horizon. What I don't understand is where is the blackhole, and what is that long stream of hot gas? Is it going just into space or is it coming from the star that is out of the picture. If the star is in that mass of clouds in the upper left where is it, and is that little tiny black dot the alleged blockhole? I should thank you for your excellent works. I have a problem for copying the articles. how can I have them with their pictures. Very wonderful. The moment was captured with extreme precision.